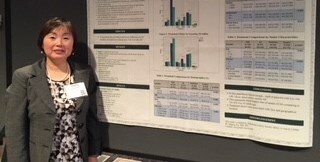 A research poster presented by Wayne State University School of Medicine Professor of Family Medicine and Public Health Sciences Jinping Xu, M.D., M.S., was highlighted and selected for a "poster walk" at the 2017 North American Primary Care Research Group, an annual meeting on primary care research held Nov. 17-22 in Montreal. A poster walk is a program designed to introduce students, residents and fellows to experts in a specified field. Dr. Xu presented "Update on Treatment Options for Prostate Cancer Study (TOPCS): A Population-based Survey of Men with Low-risk Localized Prostate Cancer" on Nov. 18. More than 1,100 primary care researchers from around the world attended the annual meeting. This study brings attention to the global health issue of over-diagnosis and overtreatment of men with low-risk prostate cancer, Dr. Xu said, and the importance and growing trend of men selecting the Active Surveillance approach as initial management strategy. Dr. Xu leads a team of researchers from the Barbara Ann Karmanos Cancer Institute in Detroit and Emory University. She has recruited more than 1,800 men with newly diagnosed low-risk prostate cancer from two cancer registries in the Detroit area and the state of Georgia. This epidemiological study is funded by the American Cancer Society. Dr. Xu will also follow a subgroup of men to determine how long they stayed on the AS protocol, how many changed to an active treatment plan (either surgery or radiation) and their quality of life two years after diagnosis. "The overall objective of the study is to identify determinants of treatment choice in men with low-risk prostate cancer, particularly the factors that affect the offer, acceptance and adherence of Active Surveillance," Dr. Xu said.